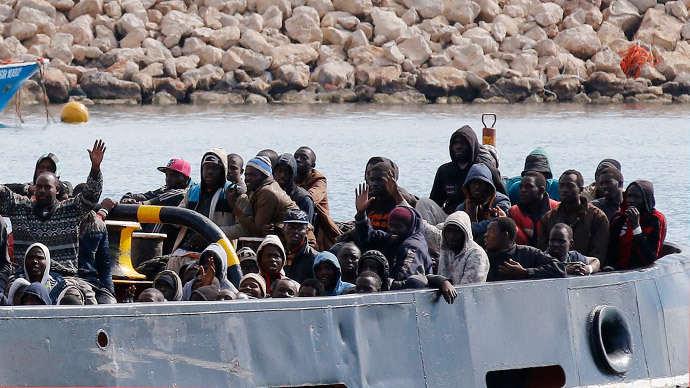 Britain is to offer military and intelligence support in the fight against people smugglers in Libya in an effort to halt the flow of migrants across the Mediterranean Sea. The offer comes as EU foreign and defense ministers continue to discuss solutions to the crisis, which has led to the deaths of roughly 1,800 migrants in recent months. Former Navy chief Admiral Lord West has said a “close blockade” of the Libyan coast is feasible but would be difficult. He also argued human traffickers would quickly find alternative routes. Britain’s proposal of military assistance comes after the UK government refused to accept an EU plan aimed at resettling migrants who attempt to cross the Mediterranean. UK Foreign Secretary Philip Hammond and Defence Secretary Michael Fallon are to offer a series of measures to tackle people smugglers at an EU meeting in Brussels on Monday. One proposal includes switching one of Britain’s biggest warships, the HMS Bulwark, to a combat role to counter human trafficking networks. Led by Commodore Martin Connell, the warship is currently involved in search-and-rescue efforts to save people at risk of drowning on unsafe boats. A draft EU military plan features small ground operations in Libya, such as destroying traffickers’ fuel dumps and embarkation facilities. “A presence ashore might be envisaged if agreement was reached with relevant authorities,” the plan states. Other proposals in the plan include high-seas boat seizures using aircraft and amphibious ships. Boarding migrant ships to arrest traffickers would involve “a high risk of collateral damage including loss of life,” the plan adds. Military operations in the area will face a “robust threat” according to the EU draft proposal, as militias in Libya have set up artillery batteries on the coast. Britain intends to contribute intelligence gathering through the use of Royal Air Force or Royal Navy drones. Such intelligence would be used to monitor people smugglers as part of any offensive. Former Navy chief Admiral Lord West said the plan would be relatively low risk and would save lives. “And I think within a matter of weeks they would be looking for other ways of achieving it, which of course they will always try and do that,” he added. Lord West said Britain should aim for a UN Security Council resolution to support the proposed operations. He went on to say it was difficult dealing with Libyan authorities, given the fragmented state of the country. “I think we should try and deal with - there are effectively two governments in Libya at the moment which makes life difficult, and lots of warring groups - come to some agreement with them that we can send boats back into a harbor, and some way of disabling them, or disable them at sea and send the people back into shore,” he said. The peer added the finances of people smugglers should be tracked, as the money often ends up in London or Switzerland. A government spokesman said details of the EU plan were under discussion, emphasizing that there would be no boots on the ground in Libya. The proposal comes a week after Home Secretary Theresa May reiterated her refusal to accept a mandatory EU refugee quota system aimed at sharing Mediterranean migrants across Europe. May’s hardline approach was condemned by human rights groups, including Amnesty International who said the UK should “remain open-minded” about the scheme.